Bangkok (Thailand) – May 25, 2018 – Mekong Kingdoms is proud to announce the maiden Mekong River voyage of Gypsy, an ultra-exclusive two-cabin river cruiser, between the ancient Laos capital of Luang Prabang and Thailand’s Golden Triangle, in May 2018. A private tailored three nights, four days cruise from Luang Prabang to the Golden Triangle and a two nights, three days cruise from the Golden Triangle to Luang Prabang for up to four passengers are on offer. For those who seek a superior cruise experience that can be as spirited, laidback or personalised as their heart and soul desire, Gypsy offers the most intimate journey where adventurous voyagers and armchair travellers alike can enjoy first class services – from plush contemporary surrounds to gourmet meals and bespoke experiences both on board and ashore. For Bangkok based design consultant Ms Jiraparnn Tokeeree from TOUCHABLE, furniture and interior design is more approachable and touchable than the abstract concept of art – for her, art is all around us and she adapts aesthetics and artistic aspects into her designs in order to accentuate this notion. For the Gypsy interior design project she fashioned a harmonious social atmosphere of modern homely design, juxtaposed with hints of the glamorised bygone era of romantic voyaging. The well-appointed spacious sleeping cabins are fully air-conditioned and consists of a king bed and twin beds configurations, each with an en-suite shower and vanity. Intimate touches of bathrobes and slippers; crisp white bed linen; regular and feather pillows; and a choice of exquisite bathroom amenities provide convenient functions with the comfort of home. A hair dryer, vanity and make up mirror are provided, while a personal safe promises in-room safety. Cruising along the majestic mighty Mekong River from near the world renowned Anantara Golden Triangle Elephant Camp & Resort in Chiang Rai to the UNESCO World Heritage city of Luang Prabang conjures up images of old Indochina, of languorous days gone by, teeming with exhilarating river adventure, mystical temples and stunning untouched scenery. 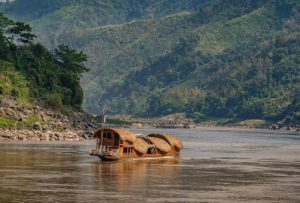 Voyagers will be captivated by the languid river lifestyle, soaking in nature’s wonders along the Mekong River Valley, marvelling at encounters with fascinating local cultures as they stop at villages and attractions along the way. Daily shore excursions offer a mix of age old culture, local immersion and adrenaline charged adventure and include guided jungle treks; mountain biking in Ban Houy Phalam; freshwater fishing; a traditional weaving workshop at Ban Baw; Laos whisky tasting; a visit to a little known elephant camp in Pak Beng; and the Pak Ou caves – with its breath taking limestone karst formations, these two caves have been gifted thousands of Buddha images, left by pilgrims over the centuries. Even while cruising the placid waters, guests can enjoy a range of wellness, cultural and fun diversions on board, including yoga; folk dancing; learning to speak the Laos language; weaving workshop; and cooking class. After an adventurous day of exploring Southeast Asia’s most beguiling waterway, the boat’s open decks offer a welcome respite to savour a decadent Champagne high tea while watching the world go by. As the sun sets, cocktails on the panorama deck are the order of the day before retreating to the dining area for an evening of fine dining and imbibing, courtesy of the on board chef. Rates start from USD 5,450 for a three nights, four day cruise from Luang Prabang, Laos, to the Golden Triangle, Thailand; and from USD 6,950 for a two nights, three days cruise from the Golden Triangle to Luang Prabang. Rates are per boat for up to four guests and include all on board meals; welcome reception with canapés; soft beverages, water, beer, selected wines and coffee and tea; Wi-Fi; shore excursions, English guide, entrance fees and transfers; on board activities; return airport or hotel transfers; and gratuities. Children aged four years and under travel free. Mekong Kingdoms, a division of Minor Hotels, is pioneering a stylish new way of exploring the Mekong River with modern boats, bespoke itineraries and a playful, artistic spirit. Mekong Kingdoms cruises recreate and elevate the concept of river travel with a fleet of five vessels offering first class services in plush contemporary surrounds, including a 13-cabin boutique barge and a two-cabin ultra-exclusive cruiser for two-night and three-night cruises between Luang Prabang in Laos and the Golden Triangle in Thailand; and three day boats for shorter private excursions for couples to a floating lounge ideal for private events and family celebrations. Mekong Kingdoms cruises join Minor Hotels’ existing fleet of Manohra Dining Cruises in Bangkok and Anantara Overnight Cruises that sail from Bangkok to Thailand’s ancient capital of Ayutthaya.